• It has long been believed that plant species from the tropics have higher levels of traits associated with resistance to herbivores than do species from higher latitudes. A meta-analysis recently showed that the published literature does not support this theory. However, the idea has never been tested using data gathered with consistent methods from a wide range of latitudes. • We quantified the relationship between latitude and a broad range of chemical and physical traits across 301 species from 75 sites world-wide. • Six putative resistance traits, including tannins, the concentration of lipids (an indicator of oils, waxes and resins), and leaf toughness were greater in highlatitude species. Six traits, including cyanide production and the presence of spines, were unrelated to latitude. Only ash content (an indicator of inorganic substances such as calcium oxalates and phytoliths) and the properties of species with delayed greening were higher in the tropics. 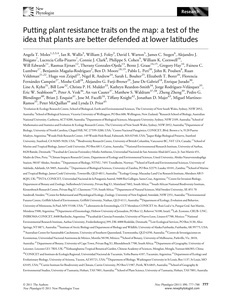 • Our results do not support the hypothesis that tropical plants have higher levels of resistance traits than do plants from higher latitudes. If anything, plants have higher resistance toward the poles. The greater resistance traits of high-latitude species might be explained by the greater cost of losing a given amount of leaf tissue in low-productivity environments.